Welcome to a Stylish 2016- Favourite Trends and Buys for January So Far!! Happy January to You All!! Its great to see in a new year and I really hope I'm going to contribute to my blog on a fairly regular basis this year- style inspiration permitting of course! It goes without saying that I hope to catch up again soon with you on either your blogs, instagram, twitter and pinterest too! I admit to being a more regular contributor to instagram as its so easy and slightly obsessional to interact this way-if not a tad lazy though!! 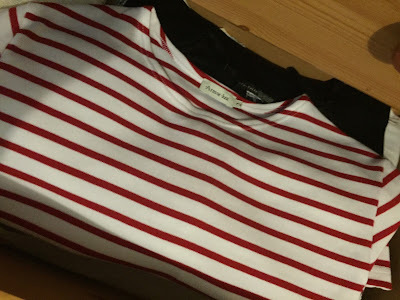 Anyhow I've been inspired by stripes- from mutual bloggers, friends, style magazines, social media and mainly the fact I've always had a 'thing' for stripes-Breton in particular. Navy or red in any style combination works great for me and I seem to be constantly adding to my ever growing collection. Here are some pictures (credit: pinterest, google) that have really piqued my interest- you really can't beat a red, navy and white combination!! Love how Kate is rocking this red cardi/jacket over her Breton top!! One of my favourite striped looks, I recently shared this pinterest on instagram. A reverse of above really!! A red bag is an essential with navy stripes if a red jacket is unavailable this coming season!! Love the crop top and those sleeves are just soo cute!! So here are my new Adidas Pro Model high tops that I snagged in the sale a few weeks ago- I purposely was looking for some Nikes or Adidas that could scratch the red stripe itch and these fit the bill perfectly!! I also caved in to my renewed vintage bag obsession, starting this year with a new to me Louis Vuitton Speedy 25!!! I defintely needed (ok-wanted badly) a red and white striped Breton so this lovely new Armor Lux version is going to be seeing a lot of action!! So slightly off topic on stripes but going back to the bag itch- I hunted for an oversize black tote and found this perfect one for me in Primark in the sale for £5!! Perfect for work and afterwards when you've forgotten to put a few plastic bags in your handbag for those last minute grocery purchases!! So onto a really coveted thrift find- I do love a logo sweater so I was really pleased to score this 90s original Benetton sweatshirt in a local Cancer Research for just £6.99!! Perfectly my size and a year round item that can be worn with anything- I love it!! I admit to another striped top and more Louis Vuitton but I'll share that another time!! So what is inspiring you this January- have you indulged in any purchases that will be seen regularly?!! I look forward to seeing your new items for 2016 in action!! Thanks as always for stopping by, reading, commenting and remebering I'm still here too!! Wishing you all a fabulous 2016!! Cannot beat red, white and blue combo, it's just classic. I do hanker after a Breton top; there's a brilliant shop in Plymouth for all things sailing that's been there for years, that I strain to walk past on my trips there. Alas, with big boobies, I think that would be a huge 'fail'! Nice to see you pop up at the top of my reading list again. You always score some really good finds. You are back with a bang Sharon!! So lovely to see you blogging again! I love, love, love your red and white Adidas and so envious of your LV bag....what a find! Hello there!!! How fab to see you.POP up in my reading list!! Hope all is well! Are you still working at ICL? Hi Michelle!! thanks as always for your kind and lovely words, much appreciated- yep you can't beat Breton stripes and new trainers to start the year off with LOL!! Ohh, you're back! Love a good stripe top, and those purchases of yours are gorgeous! Hope to see more posts from you this year (is it still OK to say Happy New Year?!). Hello! Still getting all the stylish bargains I see!